You are here: Home / Calling all students: Be a Planet Forward Correspondent! In 2009, I started the Planet Forward project at George Washington University to address a need in the sustainability and environment discussion: Storytelling. I believe we need compelling, emotional, factual, approachable and inspiring stories about science, technology and sustainability to move our planet forward. Our goal has always been to empower and engage new, young voices in this conversation. 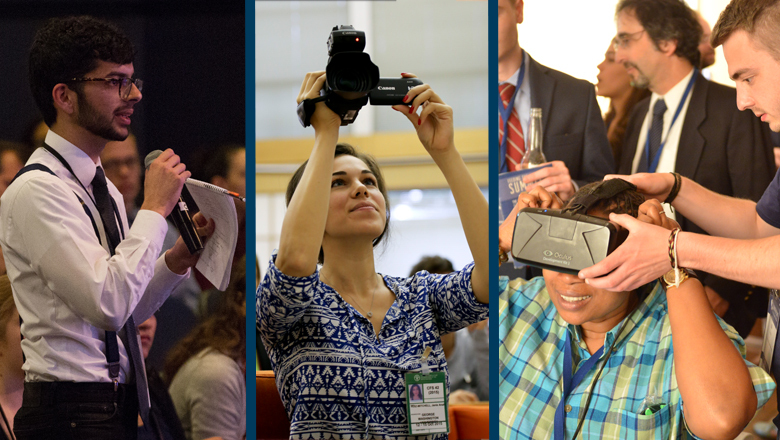 As such, I'm proud to announce that we are launching a unique reporting and storytelling experience for college students in 2016-17: The Planet Forward Correspondent program. We are on the hunt for 10 of the most engaged students who are interested in environmental journalism, are great storytellers (or want to become great storytellers), and are motivated by science, the environment or journalism — or all the of the above. Correspondents will work directly with Planet Forward's experienced media team to guide and educate them on the art of communicating science and sustainability. Over the course of the year, you'll file six stories to our editorial team, and as a reward for doing so, you'll have a travel grant to attend our major Summit in Washington, D.C., on April 6-7, 2017. Plus, you get a cool title to put on your resume — not to mention an amazing portfolio of work. Ready to join our team? Know some students who would be interested? Get more information and sign up to be a Planet Forward Correspondent. The deadline [has been extended to September 28, 2016,] and we'll announce our Correspondents on October 3, 2016 on PlanetForward.org.